GTT Training – a subsidiary of GTT that focuses on training LNG professionals and developing related simulation tools – has announced that it has obtained two approvals from DNV GL for its G-Sim training software. DNV GL’s standard for maritime simulator systems specifies the requirements of simulators that will be used to provide training for the shipping industry in accordance with the STCW convention requirements. Both the G-Sim software and the LNG Carrier models have been granted Type A ‘Full Mission’ approval. This classification confirms that G-Sim is capable of providing full environmental realism for simulating the complete liquid cargo handling and auxiliary systems for the vessels defined. This is enables the software to help provide training in all aspects of cargo handling operations. 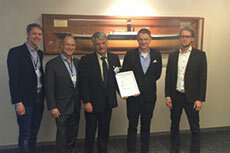 The LNG Bunkering Simulator has also been awarded Type S (Special Tasks) approval classification. This model provides a similar level of functionality to the LNG carrier model, but is specifically related to the simulation of LNG bunkering operations. The CEO of GTT Training, Ray Gillett, said: “The approvals issued by DNV GL confirm the reliability and quality of G-Sim software. They confirm the legitimacy of the simulator and strengthen its position in the maritime simulation systems market. Moreover, G-Sim serves as an additional guarantee for gas operators wishing to deliver a high level of training to their crews." G-Sim software provides 12 possible vessel configurations overall for the operator (depending on the propulsion system, containment system and tank capacity). This covers a number of different potential situations that the crew are likely to encounter. In addition to this, it provides practical training in real time on both the methods and procedures to carry out operations that may need to be done on LNG vessels regarding both the handling and management of LNG cargoes. DNV GL has released a statement claiming that it has granted general approval for ship application for VARD’s new LNG-type B-tank design. Gaztransport & Technigaz has announced that it has been awarded an Approval in Principle from the China Classification Society for its cargo handling system for an LNG bunkering vessel concept. GTT has announced that it has received general approval from Lloyd’s Register for its Mark V LNG containment technology. 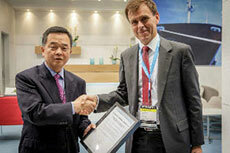 DNV GL has awarded an Approval in Principle certificate to Hyundai Heavy for its SkyBench concept.